The retail giant has embarked on an ambitious, top-secret plan to build a domestic robot, according to people familiar with the plans. The Vesta project originated a few years ago, but this year Amazon began to aggressively ramp up hiring. Now Amazon is working on another big bet: robots for the home. The retail- and cloud-computing giant has embarked on an ambitious, top-secret plan to build a domestic robot, according to people familiar with the plans. Code-named Vesta — after the Roman goddess of the hearth, home and family — the project is overseen by Gregg Zehr, who runs Amazon’s Lab126 hardware research and development division based in Sunnyvale, California. Lab126 is responsible for Amazon devices such as the Echo speakers, Fire TV set-top-boxes, Fire tablets and the ill-fated Fire Phone. It’s unclear what tasks an Amazon robot might perform. People familiar with the project speculate that the Vesta robot could be a sort of mobile Alexa, accompanying customers in parts of their home where they don’t have Echo devices. Prototypes of the robots have advanced cameras and computer-vision software and can navigate through homes like a self-driving car. Former Apple executive Max Paley is leading the work on computer vision. Amazon has also hired specialized mechanical engineers from the robotics industry. The project is different from the robots designed by Amazon Robotics, a company subsidiary, in Massachusetts and Germany, people familiar with the project say. Amazon Robotics deploys robots in Amazon warehouses to move around goods and originated as a company called Kiva Systems, which Amazon acquired in 2012 for $775 million. 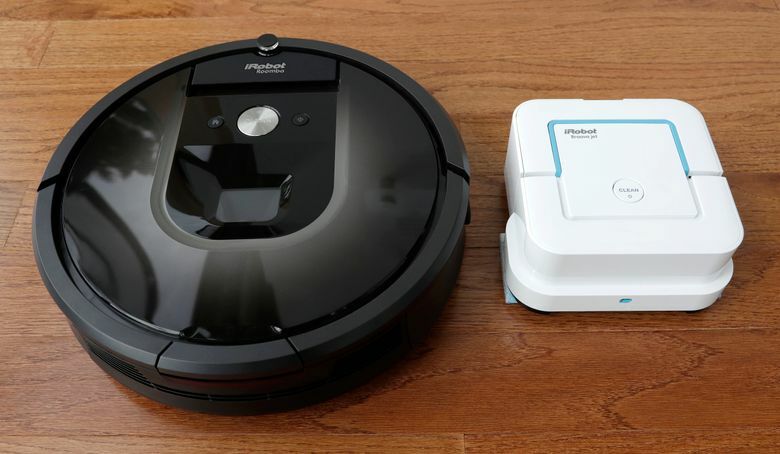 The promise of domestic robots that offer companionship or perform basic chores has tantalized the technology industry for decades. Nolan Bushnell, the founder of Atari, introduced the 3-foot-tall, snowman-shaped Topo Robot back in 1983. Though it could be programmed to move around by an Apple II computer, it did little else and sold poorly. Subsequent attempts to produce useful robotic servants in the U.S., Japan and China over the years have performed only marginally better. iRobot’s Roomba, which only does one thing — vacuum — is the standout in the field and has sold more than 20 million units since 2002. The company’s shares fell as much as 8.6 percent on Monday, the biggest intraday decline since early February, and was trading down 5 percent in early afternoon trading. More recently, Sony and LG Electronics have shown interest in the category. In January at CES, LG showed off a robot called Cloi in a demonstration that failed multiple times. Sony demonstrated a new version of a robotic dog called Aibo, which it sold a version of until the mid-2000s after first unveiling the concept about 20 years ago. It doesn’t do much other than bark (although Aibo has been programmed to play soccer). The canine bot also costs $1,800, or about the same price as a real dog from a breeder. We’re still years, perhaps decades, away from Rosey, the iconic housekeeper from “The Jetsons,” according to Siddhartha S. Srinivasa, a professor of robotics at University of Washington’s Paul G. Allen School of Computer Science & Engineering. How long exactly, is impossible to predict, he said. That’s because he expects robotics innovation to continue unfolding along a ramp, with gradual advances in ability and functionality abetted by unexpected breakthroughs experts can’t foresee. “The Holy Grail,” Srinivasa said, is the robot that not only moves around, but physically interacts with the world around it. The challenges ahead are many. Among the big ones, Srinivasa foresees: Designing homes that are compatible with robot movements. It’s much easier to design a robot that moves around a factory floor, he said, than it is to design one that can sidestep an ever-changing landscape of dirty clothes piles and children’s toys. Next up: Creating a robot that offers meaningful interactions with humans inside the home, adjusting to cultural differences and social norms. Understanding how human behavior differs from household to household, Srinivasa said, is “incredibly hard problem” that researchers are still unpacking. Finally, he said, companies like Amazon will have to tackle to privacy questions that arise when a robot enters a home and begins collecting data – a more sensitive version of the questions currently swirling around tech companies like Facebook. People are much more protective of their homes than any other space, he said. Advances in computer-vision technology, cameras, artificial intelligence and voice activation help make it feasible for Amazon to bring its robot to the marketplace. The retail giant has shown itself willing to partially subsidize the costs of its devices for Prime subscribers who buy more products and subscribe to services through its gadgets. That could also make such a product more affordable for mainstream consumers in the future. Information from The Washington Post was included in this report. The Post story originally published at washingtonpost.com. Read it here.